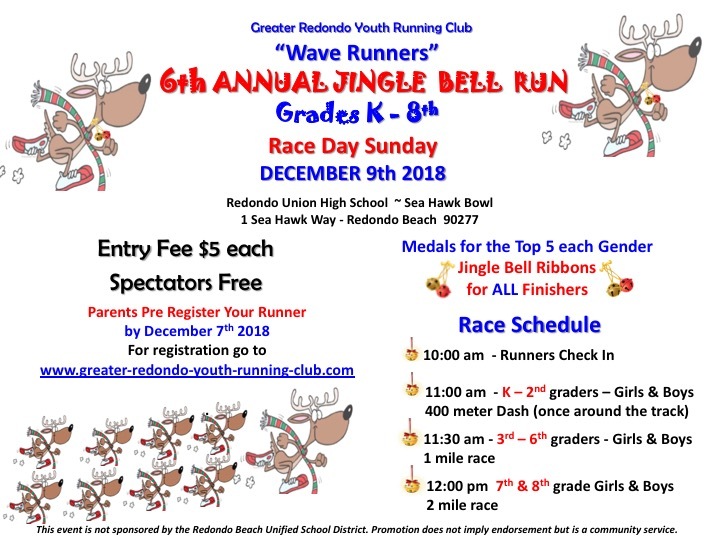 6th Annual Jingle Bell Run for K – 8th graders. • 10:00 a.m.Runners Check-In – (Check-In should be 30 minutes before your race time). • 11:00 a.m. – K – 2nd grades – 400m Dash – Girls and Boys will run together. • 11:30 a.m. – 3rd – 6th grades – 1 mile race – Girls and Boys will run together. • 12:00 p.m. – 7th – 8th grades – 2 mile race – Girls and Boys will run together. Top 5 Boys and Top 5 Girls in each race will receive Medals. ALL Finishers will receive a Jingle Bell Ribbon. This entry was posted in Jingle Bell Run, Wave Runners Youth Running Club, Youth Cross Country by Laurie. Bookmark the permalink.